I really wanted to LOVE this book. However, I found it to be a solidly average book. Let’s start with the flawed presentation. When choosing patterns, I like to be able to see detailed pictures from several angles to really get a feel for the piece. The photos here were very model-focused with few close-ups of each item. This does not help persuade me to knit an item. If I can’t see enough detail, I will move on to other projects where I am able to see this. There were just a couple patterns that I really didn’t like. The Exeter “mitts” (as they refer to them, I call them fingerless gloves) were a bit boring and I thought the wrist section was too short to keep wrists warm. Also, the 80’s called and they want their Yarmouth vest back. And the horizontal stripes. Ugh. I liked quite a few patterns presented. In contrast to the Exeter mitts, the Heyworth mitts have an interesting texture and look like they’re longer on the wrists, able to keep us cold gals warm. The Lyndon socks look comfy. The Bethel headband looks like it would be functional. Bonus: it’s also super cute. The Genessee cardigan is a nice, basic cardigan embellished with pretty lace detailing. The Keene pullover sweater has a timeless, classic design. The Cape Elizabeth (a cape, naturally) has a really interesting design and is the only pattern I’d be tempted to really try. 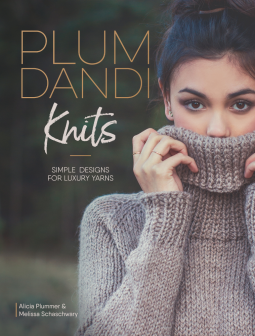 Given that there’s only one in the book, I’d probably see if it’s available as an individual pattern on Ravelry or through the publisher’s website. If not, I’d try to find a similar design so as not to have to purchase the entire book. The thing that impressed me most about the patterns is that they were written for a large range of sizes. Being a plus-sized gal myself, this is a huge selling point. So if I couldn’t find patterns like these in my size in other places, I’d certainly spend the cash to get these. From a marketing perspective in the book, though, you really have to look at the pattern to see the size range since it’s not indicated by the selection of models. These gals are quite thin. A downside to this is you don’t get to see what the patterns look like in larger sizes. Since this is such a mixed bag and similar patterns are all over Ravelry and the internet in general, I’d save my money and put it towards yarn! I am grateful to NetGalley and Interweave for the ARC ebook.